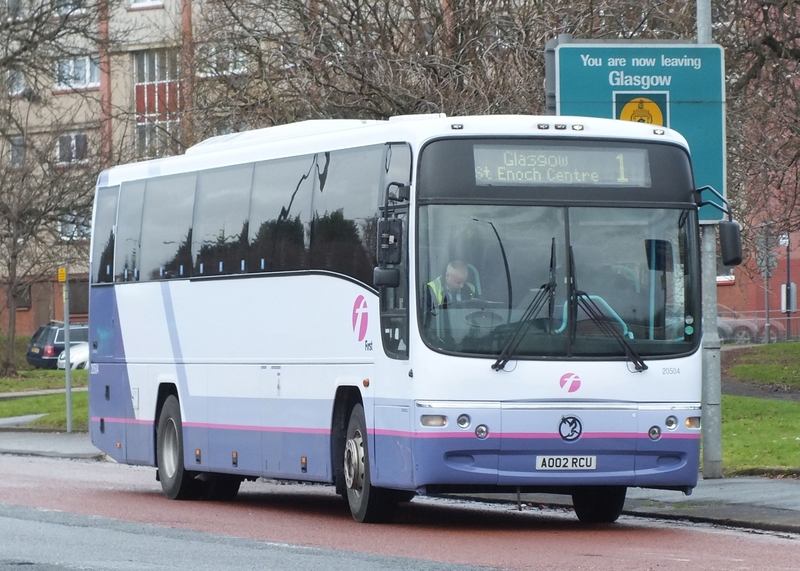 Following poor patronage the route is to be withdrawn with effect from the 11th February. Apart from the first bus after the 09:30 concessionary travel pass deadline, the service runs with only a few passengers on each journey. Yesterday was the first day of these temporary arrangements and from my observations it appeared to be working well, considering the disruption to services. There were a couple of problems; the first was when a delivery driver parked on Alexandra Road blocking it for buses although the delays were minimal. The temporary stops for some town and rural bus services have been moved to a lay by outside Fish N Chick'n near St George's Park. Hemsby at the same time as the departure of First Eastern Counties Dart 43487 R687DPW on the 2 to Barrack Estate. Subsequently, Dart 43487 retraced its steps through Barrack Estate and returned to Market Gates before continuing on its journey to the James Paget Hospital. It is seen here negotiating the right hand turn at the bottom of Yarmouth Way into South Quay. A bonus was the arrival of the MAN City Smart demonstrator WX12EKO at the Troll Cart stop. However, it did not immediately transfer to the St George's Park stop, which led to some confusion among passengers. However, the driver picked up at both stops to ensure nobody was left behind. Additionally, I had a run home on her as a passenger on the 581 service to Beccles and saw Joe Watson of Norwich Bus Page taking a photo of her on Southtown Road! Hopefully the temporary arrangements at Market Gates continued to run smoothly during the rush hour periods. I would be interested to hear from readers as to whether in fact this did occur. G470LVG ~ The Mystery Solved! Regular readers of this blog will remember Sunday's entry regarding two former Caroline Seagull Dennis Javelins G469LVG and G470LVG. After the recent disappearance of the latter from Swift Taxis Southtown Road premises, I decided to email the operator's General Manager, Kevin Boyne, to find out what had happened to her. 'I am extremely happy and excited to say that I have purchased the ex-Cobholm Hire Services (Caroline Seagull) and Swift Taxis 1988 Plaxton Paramount 3200 bodied 1988 Dennis Javelin G470 LVG. When I found out that she was to be withdrawn and sold for scrap otherwise, and no one else took up the offer to save her, I decided to put my heart where my money is and buy her off her previous owner, Swift Taxis, for her scrap price. She's been brought, stored and put/kept in service in the Great Yarmouth area for just over 22 and a half years, since brought new, and I'm also pleased to say that she, as a Preserved Coach, is to be stored, by me - as her new owner - still in the Great Yarmouth area - along with my other Preserved PCV/PSV Vehicle - ex-Great Yarmouth Corporation 1968 Marshall bodied 1967 Leyland Atlantean Single Decker 40 - GEX 740F. I brought G470 LVG back in November and she requires front brakes, rear air suspension and some chassis rust removal and welding to be sorted out first before she get an M.O.T. - which I'm hoping to get sorted out this summer and, to which, I am currently saving for. She will, after a few years rallying with her ex-owner's livery, will, also, be getting a repaint back into the Caroline Seagull livery - as she wore back in the old days. Unfortunately though, I don't have/can't find any photos of her in any of the Caroline Seagull Liveries she wore, so, do you guys know if you can ask the fellow readers if they have any photos of her in any of the Caroline Seagull Liveries - especially her last livery - and, possibly, if I/we at Eastern Bus Enthusiasts - http://easternbusgroup.weebly.com/index.html could have a copy of the photo - with and under the owner's permission and copyright - to use on our site to use to show what this vehicle was like when with Caroline Seagull ownership please? Kindest regards to you guys and to all of your readers. Thanks for the photos and email in helping to solve the mystery, Terry and I hope it won't be too long before we see her at any of the local bus rallies. 'These included a trip to Jordan's at Coltishall, if memory serves me, I think I went along with a couple of friends to look over the ex First Blue Bus/GYT metroriders. The top picture shows E42OAH new to Great Yarmouth Transport in 1987 as their 42; she became 785 in the First Blue Bus fleet upon acquisition in 1986. 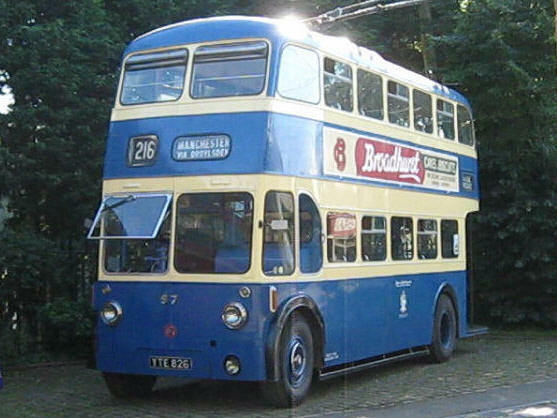 Laying on her side is Leyland National 615 PEX615W in First Blue Bus livery. She has a along association with the town being allocated to Eastern Counties' Wellington Road prior to receiving Blue Bus livery. The final photo is one of coach GWV935V; a Plaxton Supreme bodied Leyland Leopard which was new to Southdown in 1979. Ambassador Travel purchased her from East Yorkshire in 2001 becoming their fleet number 1018. It only ran for a couple of years before its demise. G469LVG/HKZ1329 spent ten years in the ownership of Smiths Coaches of Blofield and I photographed her at Blackfriars Road in Great Yarmouth in June 2010, quite oblivious to her Great Yarmouth historical link! 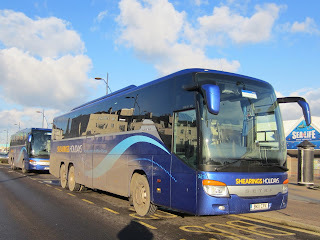 Whilst enduring temperatures close to freezing point, he managed to photo some of the bus activities at that time. A notable arrival on the 603 service from Carlton Colville was Optare Solo 305 MX53FDP; a rare visitor to Lowestoft. Turning to First Eastern Counties, both former TownLynx Enviro 200s were on Lowestoft Town Services. My thanks to Grahame for the report and the pictures and trust that the hands have now warmed up! Operating between Bedford Bus Station and Great Yarmouth, Beach Road Car Park given service number A effective from 31-Mar-2013. To amend Timetable. Operating between Carlton Colville and Lowestoft given service number 603 effective from 11-Feb-2013. It was reported in the Eastern Daily Press today that an Anglian bus caught fire at Ellough in Beccles late yesterday afternoon on its way back to the depot. It is thought the cause might have been an electrical or engine problem with a diesel bus which received significant damage. Damage was also done to the road surface.requiring the Highways Agency to be called out. At the moment the identity of the vehicle involved is not known. On a positive note, two more of Anglian's new MAN EcoCity gas powered buses were due to enter service on the 588 route yesterday between Haleworth and Norwich via Bungay. This now brings the total to ten of them now in service with just three more outstanding. However, Zak Nelson was lurking in the Gorleston area and was able capture both of the newcomers in the standard Anglian livery. Unfortunately I have been struck down by an attack of the dreaded lurgy and hence there has been no postings on the blog since Sunday night. The photo from Neil Chilvers in the last blog post has prompted regular contributor Grahame Bessey to search through his archives. predominance of the Mercedes-Benz Varios with the Suffolk operator at that time. Fast forward four years to 2010 and the Scania OmniCity's take centre stage both in single deck and in double deck form. line ups at the Ellough depot show how much the company has changed in the type of vehicles they have operated over the years. Today's blog entry is from the postbag - or should it be from the email inbox !? 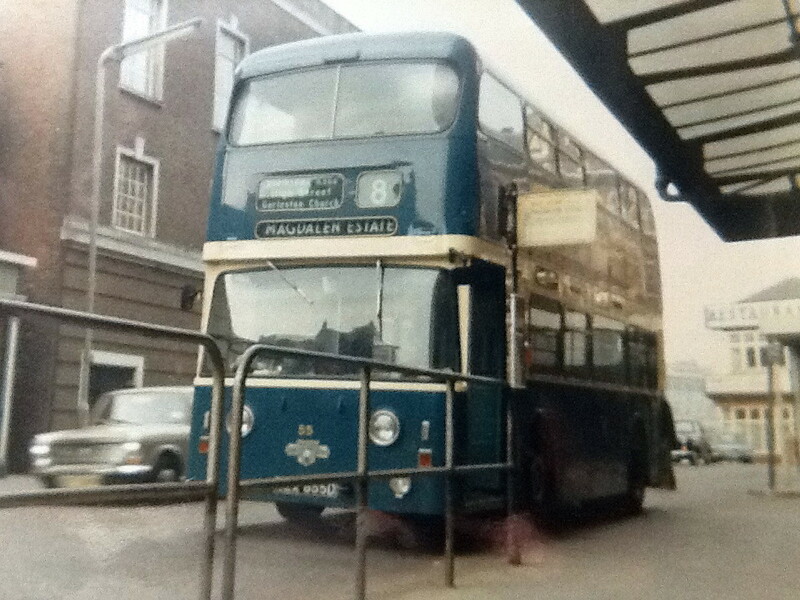 The second photo was taken by Mike Sayers in 1968 which shows Great Yarmouth Corporation Transport No 55 EEX855D on Theatre Plain awaiting for departure to Gorleston's Magdalen Estate. 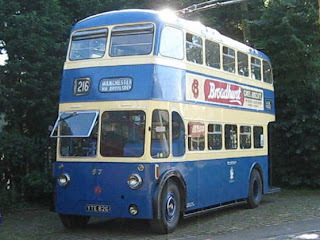 The Roe bodied Leyland PDR 1/2 was new to Great Yarmouth in December 1966. Note the long gone Nicholls Restaurant in the right background! A good year was 1966 - my first year in work (with another 40 to go) and the year England won the World Cup. Thanks for the photo and the memories Mike! 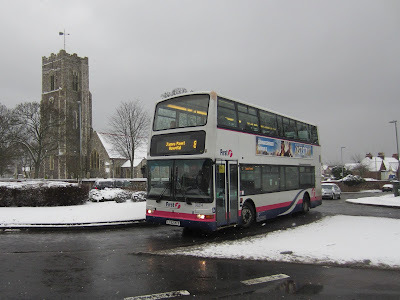 Heavy snow fell overnight and this morning on the east coast with bus services being affected in the Great Yarmouth and Lowestoft areas. First's services continue to operate in Great Yarmouth but severe delays to the timetable are expected. 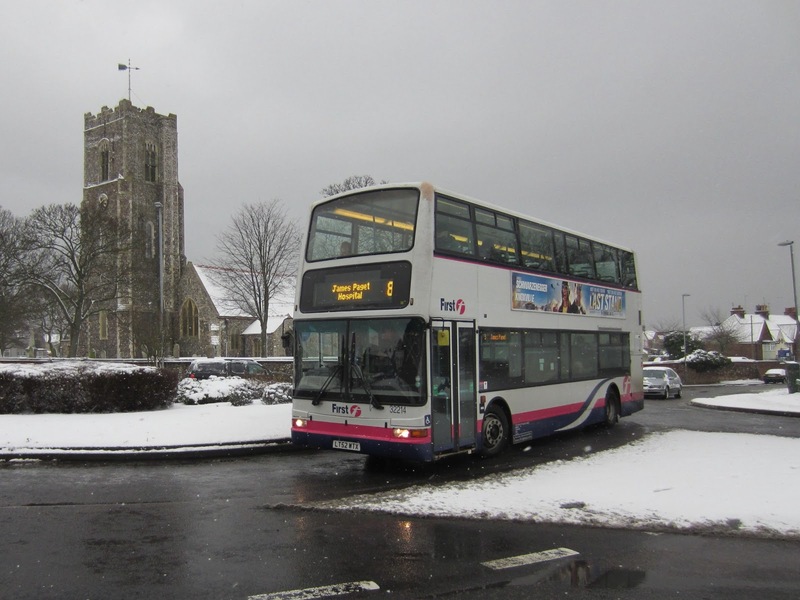 In Caister the village housing estates cannot be served whilst service 5 to Burgh Castle has been cancelled due to the icy roads. The MAN CitySmart is a 10.8 metre long diesel powered midibus with seating for 37. 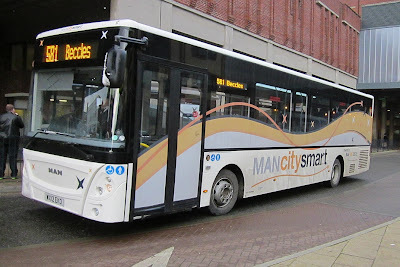 Similar in looks to the MAN Eco City gasbuses, the vehicle has bodywork by Caetano and has been designed specifically for the UK market. 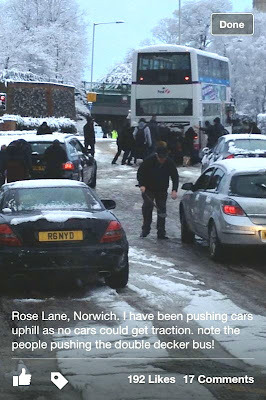 Terry Wilkins reports that bus services in Norwich, from all operators, came to an end early because of heavy blocked up traffic jams in the city centre. Terry continues that the First X1 service was abandoned and reports that one passenger left Dereham on the X1 after 1.00pm and finally got to Norwich at 7.30pm (ish). Because of the delay, he ended up waiting in the bus in the traffic jam for some five hours. Finally, another bus took him to Norwich. He joined Terry and his father at St Stephens Street in the city where they found that all bus services in Norwich had been cancelled and they ended up having to get back to Great Yarmouth by train. 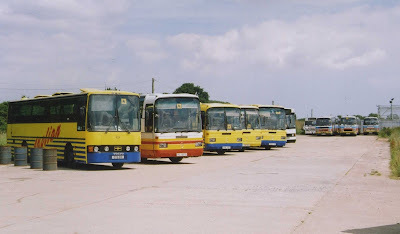 Strangely, although the X1 was cancelled, some vehicles made their way to Great Yarmouth and stopped there. The reverse has happened this morning with a report that trains between Great Yarmouth and Norwich have been cancelled due to signalling problems with buses replacing trains! In the intervening months First withdrew from the town and closed its depot at the end of March last year. Coincidentally I passed the former depot on the way to the Cotton Lane Car Park. The depot still retains its Lost Luggage sign complete with First logo but the site is now fenced off and is used for private parking. With my wife and her sisters off for some retail therapy, I made my way to the bus station at St Andrews Street North. My first photo is of Stephenson's Dart 436 LX51FGF heading south with the Nowton Estate service. Upon entering the bus station, I observed Chambers Volvo Olympian S131RLE laying over awaiting its next duty. picture of an Optare Solo from the Mulleys' fleet. I needn't have hurried as the driver slowed so that I could get a photo of his bus AE06YYU. Another notable Mulleys bus seen was that of Mercedes Benz Vario/ Plaxton Beaver AY51 EWV - previously recorded as withdrawn! for the bus station on St Andrews Street North. To sum up then, vehicles from the Stephensons and Mulleys fleets dominated in Bury by providing most of the local services. Double deckers from the Chambers fleet make regular appearances as do vehicles from Coach Services, Simonds and Stagecoach East. In comparison to my last visit, only one bus from the Galloway fleet was noted. However, it was a little eerie in not seeing any First Eastern Counties vehicles operating in the town! A brand new event for 2013, focused on the museum’s own internal roadway system. Vehicles both large and small from the museum’s extensive collection that are not usually available for public use will be operating around the site, many of which will be offering the chance to ride alongside the driver. In addition, a selection of visiting classic and vintage vehicles of all types will be on display with some joining the museum’s own fleet out on our road. To add even more variety our trolleybuses will be operating in both directions along Herting Street, giving photo opportunities of historic road transport galore! This one-off event will mark the 40th birthday of our 2 foot gauge railway in style! 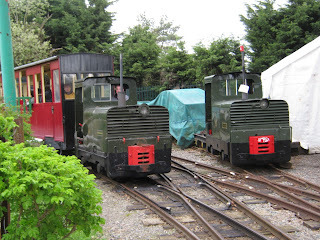 The East Suffolk Light Railway has been offering rides to our visitors since 1973 and has developed to become a firm favourite with visitors of all ages. All of the serviceable locos will be running on the line and will be joined by some visiting examples as well. For the first time ever, goods trains will be operating and unique line-side locations for photographers will be on offer to record all the action. Our trolleybus service will also be re-routed for the day, allowing visitors to travel to and from the Chapel Road Station. In addition, a display of military vehicles and model railways will be located around the museum. 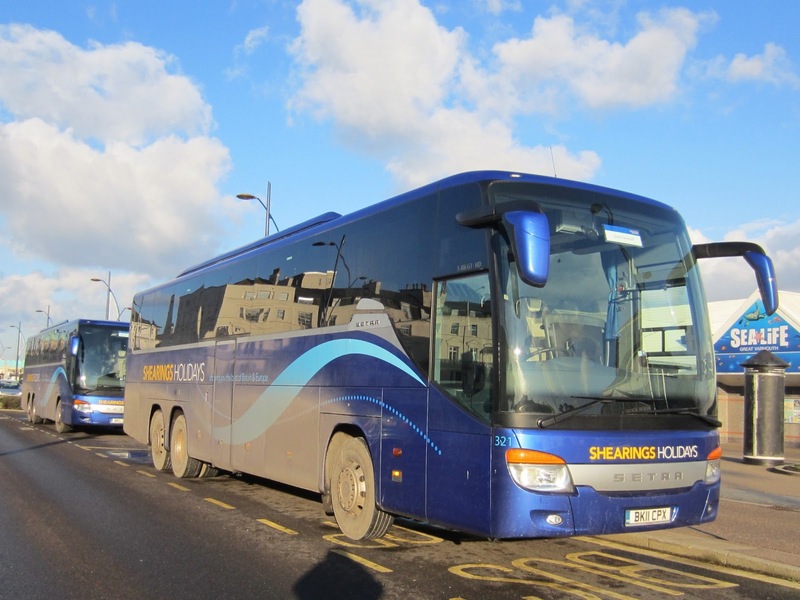 With a new title for 2013, our ever-popular annual bus and coach event will have lots of vehicles in service operating on our free regular bus services to Lowestoft and Beccles. There will also be excursions to local places of interest using the museum’s and visiting vehicles, which will be specially chosen to illustrate the development of buses and coaches in Britain from the classics of the 1940’s to the modern vehicles of today. As always plenty of free bus rides will be on offer with intensive timetables in operation! The first ever End of Season Gala will be an ‘everything goes’ weekend to round off the 2013 season! All available vehicles from our extensive fleet of Trams, Trolleybuses, Trains and Buses will be in action during the weekend. And as the nights are starting to draw in, we will be offering after-dark rides on the Saturday evening with the museum staying open until 9pm so that visitors of all ages will be able to sample the unique setting of the museum by the gentle glow of lamplight. 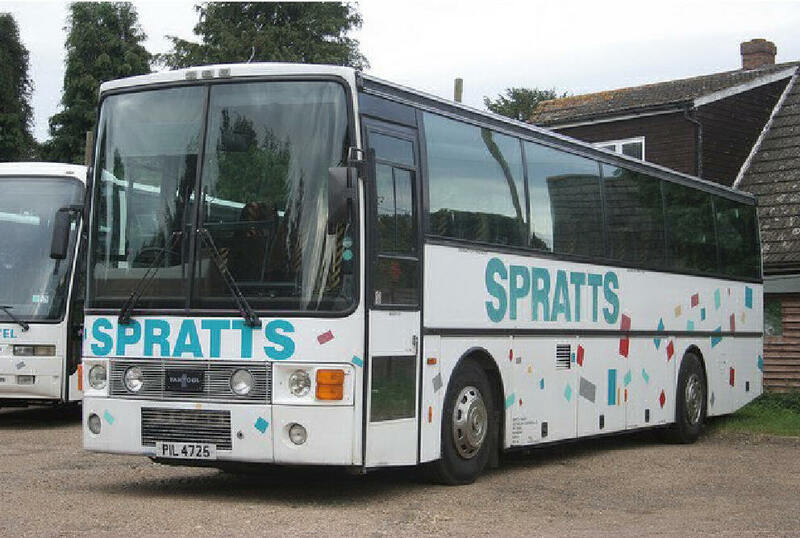 Our motor bus fleet will offer free rides to Lowestoft and Beccles throughout the event, and a special “Historic Lowestoft” service will operate around the town as part of Heritage Open Days linking us with other local museums. Our largest event of the year, this truly has something for everyone! A former Brighton Trident was noted on Anglian's 601 route yesterday; bringing a touch of the south coast to the east coast! First up is one of Bristol VR/ Eastern Coach Works 34 RVF34R at Theatre Plain in Great Yarmouth Town Centre during November 1982. Closest to the camera is AEC Swift/ECW 86 WEX686M on the service 18 to Girton Road on the Magdalen Estate. 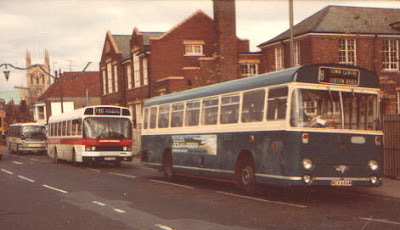 Behind No 86 is Eastern Counties Leyland National LN625 UVF625X in an experimental livery returning to Wellington Road bus station on the 790 route. Lurking in the distance is a Caroline Seagull coach. 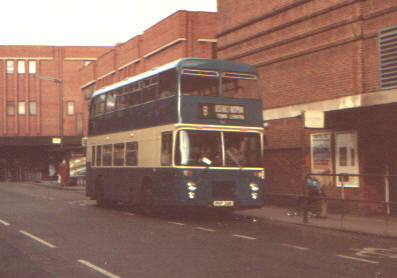 Again the photo is dated November 1982; shortly after, all services transferred to the new Market Gates bus terminus. 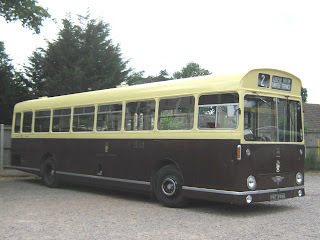 Grahame Bessey passed the Our Bus depot at South Burlingham earlier this morning.